A disjointed marketing strategy is as bad or worse than no marketing strategy at all. Since your customers and consumers don’t operate in silos, it’s essential that you plan for the eventuality that they’ll come into contact with your brand message in a number of different ways. This is why your marketing activities must be linked together into a comprehensive campaign that transcends your internal company boundaries. Confidence is possibly the most important aspect of your brand appeal. Your consumers want to know that you’ll consistently deliver on your brand promise. This doesn’t require that your marketing strategy must be complex. On the contrary, the simpler the strategy the easier it is to ensure that each and every person working on your brand understands and implements the brand strategy correctly. To make this possible, it’s essential to focus on a clear and compelling message that can be translated consistently through a variety of media vehicles. Our Frontera Marketing Group “Marketing Framework” has been developed over decades of experience in multiple industries. This simple framework provides the basic structure to develop a fully integrated marketing strategy that ensures your entire company stays in alignment. The plan doesn’t need to be complex but it does need to be clearly defined. In our experience, a good plan that is consistently applied will be a great plan that is inconsistently applied every time. While we’ve kept the Framework pretty basic in the illustration above, it really doesn’t need to be much more complicated than it appears. 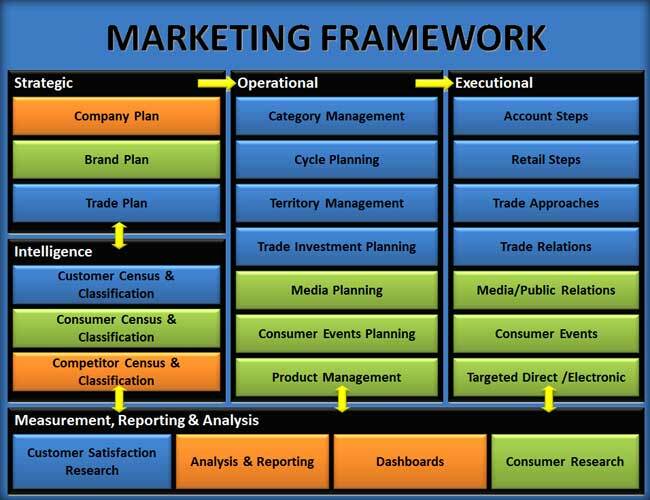 The important thing is to figure out if your brand or trade activities fit into your framework and, if so, where. If it doesn’t really fit, you stop doing it in favor of doing fewer things better or replace it with an activity that is better aligned with your strategy. Quality and strategic fit will have much more positive impact in the long run than quantity. If you have questions about certain aspects of our Marketing Framework, feel free to shoot us an email or give us a call. We’re happy to help and we love to talk about Marketing.